Protective cases are the best ways to keep your pans safe during transport. Remember, steel pans (steel drums) are fragile. You don’t want to arrive at a performance and discover your pans were knocked out of tune during transport. 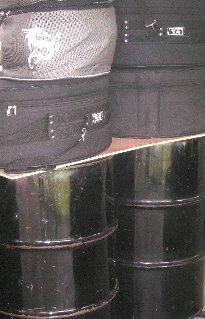 Cases for the bass pans can be very expensive, especially if you have more than one set. You can transport the bass pans without cases if you handle you them very carefully. Make sure nothing touches the playing surface. But, if the bass pans are being shipped or are going in an airplane, they should be packed in crates or cases. Protective cases can be purchased from steel pan suppliers. Steel pans (in their cases) should be transported in an enclosed vehicle to prevent exposure to heat, cold and other inclement weather. If your steelband includes a six bass, you are going to need a truck. Trucks and steelbands vary in size so there is no one way to pack the instruments. Usually, the background pans go in first. Place them upright and away from the truck door. The pans should be compact but not so close that they rub against each other. Tie down straps are excellent for holding the pans in place. Mid-range pans and drum set parts can be placed around the bass pans and then the frontline pans stacked on top of the mid-range pans. 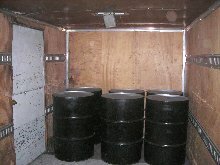 If space in the truck is limited, a sheet of plywood (or a similar flat sheet) can be placed on the rims of the bass pans and then smaller pans stacked on top of the board. Pan stands and other engine room instruments are brought in last and placed flat on the truck floor (if possible). Completely dismantle collapsible stands if you are travelling for long distances.